What’s the point of Malcolm Turnbull? So ran a recent headline in the Financial Review. The ruling elite is getting worried. It’s more than six months since Turnbull was elected leader, with the overwhelming support of big business, after Abbott was unable to deliver for them. But with an election looming, under Turnbull, the Coalition’s opinion polls have fallen from a 54 to 46 per cent lead in two party terms to 50-50. The Coalition is no longer an election shoo-in, yet Turnbull has not delivered anything that matters to the top end of town. Turnbull sold himself as a replacement for Abbott on the basis that he could deliver “economic leadership” and make the case for a new round of cuts and attacks on workers. Increasing the GST looked good for a little while—and new Treasurer, Scott Morrison started out to sell it. But Turnbull and Morrison backed off quickly when polls showed it was electoral poison. Turnbull went so far as to call the Business Council of Australia’s push to use a GST increase to cut company tax a, “go into the study, get out your service revolver and blow your brains out” political option. The new Coalition tax policy, that is meant to cut corporate tax and the tax rates for highest earners, is nowhere to be seen. Reducing the massive tax write-offs available to investors who negatively gear their property investments was initially being considered by the government. But as soon as the Labor Party put forward a concrete proposal, the Coalition backed off at a rate of knots. It is now attacking the Labor Party, scare-mongering that house prices will rise and investment will fall if Labor’s policy is implemented. Similarly, over penalty rates, the government has not been able to deliver for its business supporters. The business elite desperately wants to cut them. The Coalition would like to cut them. But Turnbull is acutely aware that cutting penalty rates is deeply unpopular. So while Turnbull and hatchet Minister for Employment, Michaela Cash, make positive noises to reassure business, the government ducked the issue and did not even make a submission to the Productivity Commission inquiry. Now, Liberal Party supporters are despairing about whether or not Turnbull is going to call a double dissolution election. 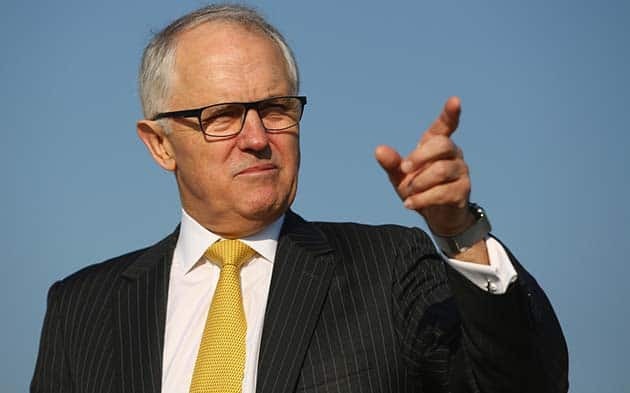 The real point about Malcolm Turnbull is that the lessons of the defeat of Abbott’s 2014 Budget and the dramatic fall of Tony Abbott are deeply etched into the Liberal Party consciousness. It was the active response to Abbott’s spending cuts and the attack on Medicare that killed the Abbott government. And Turnbull knows it. Turnbull wants cuts to re-establish a budget surplus; he wants to cuts penalty rates; he really wants to cut corporate taxes – but the government is paralysed because any of these moves risk re-igniting the active opposition to the Coalition government. What happened to “one term Tony” could just as easily be Malcolm’s fate. But there are precious few indications that Labor or the unions have learned those lessons anywhere near as well. While Turnbull’s popularity falls, instead of ramping up industrial action, protests and demonstrations, the Labor Party has put it eggs into the electoral basket. The unions’ penalty rates campaign consists of asking unionists to hand out “Thank you” cards to workers working over Easter. Astonishingly there is no mention of the on-going public servants’ dispute with the government that could see strikes at airports over the Easter period. The ACTU is rightly concerned about the possibility of the government re-introducing the anti-union building industry watch-dog the ABCC. But their campaign is an electoral one, directed at The Greens. There is no sign of the union-wide strikes and demonstrations that could really put an end to the ABCC. A rejuvenated “Your Rights At Work” campaign could take the fight against Turnbull into every workplace and onto the streets. The ALP’s response has been to launch an absurd, all-out attack on The Greens. NSW ALP Senator Sam Dastyari has labelled the Greens “a cancer on progressive politics”. But it is Labor that have voted with the Coalition 38 per cent of the time (including over refugees), compared to the Greens’ 6 per cent. Turnbull is running scared of the polls. He is haunted by the spectre of Abbott’s fall. But he is squeezed by the demands of big business who are increasingly despairing that Turnbull can deliver for them. The gloss of his three-word mantra of “Excitement, innovation, agility,” has worn off. Their despair is our opportunity. A real fight over wages, penalty rates and Medicare could see Turnbull thrown out.